Charra is an ideal village in the Kurud block of Dhamtari district. The village has witnessed many developmental activities from the various schemes of the government. One such scheme is the Pradhan Mantri Aavas Yojna, under which the poor families got a roof and today they are living peacefully. 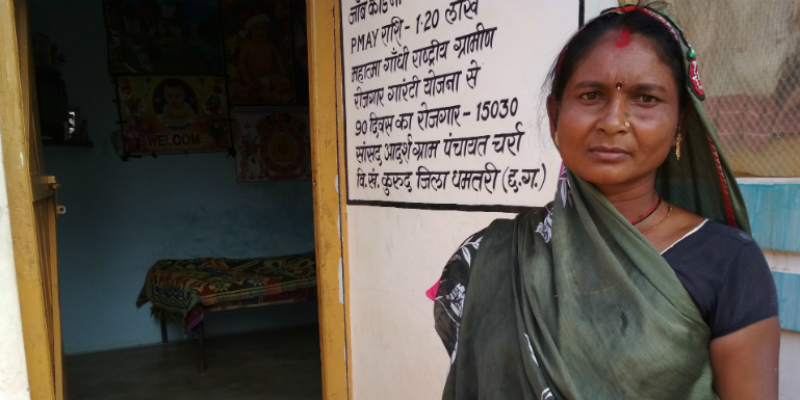 Neerkala Nishad is one of the beneficiaries of this scheme and says that if the scheme didn’t exist, her family would have never been able to build a permanent house. For a family surviving on daily wages, saving enough money to lay the foundation of a permanent house is a daydream. Nirkala Nishad has a similar story. Leaking roof and walls during rains would make her cry. That is when the thought of building a permanent house struck her mind. Somehow the four months of rainy season would pass hustling and all the planning would stay put. Worries of food would send her back to her daily routine. Neerkala’s days would be spent in laboring along with husband, Dilip Nishad, and returning home to cook food and do the dishes. She was always concerned about the future of her children a boy and a girl. Studying during rainy days was a problem for them. The dripping ceiling would spoil all their belongings like bedding, clothes and other household items. Neerkala and Dilip would wonder if they’d have to spend their entire life in their kuccha house and whether their kids would have to start their married life in that house itself. Then came the Pradhan Mantri Awas Yojana. A scheme that has provided a lot of poor people their dream homes. When Neerkala learnt about this, she, along with her husband Dilip, filled the form. A few days later their application was accepted. The entire family was extremely happy to know this and every day, over food they would discuss about their new house. They were happy that their kids will now live in a permanent house. Within few days, they got the first installment of 48 thousand rupees to build the house. As soon as they got the money, both Neerkala and Dilip started building the house. They bought the material, and got the labourers. As soon as they laid the foundation and made the walls, they got the second installment of 48 thousand rupees too. This helped in roof molding. After this, the last installment of 24 thousand Rupees led to the completion of the house. Today, Nirkala and Dilip, along with their kids, are very happy to get a house under the Pradhan Mantri Awas Yojana. Like Neerkala, there are many in Dhamtari district whose families got the benefit of this scheme. Neerkala credits their happiness to this important scheme of the government, due to which they were able to build a permanent house. Otherwise they’d have spent the rest of their lives in the kuccha house. Now, during rainy days, neither the roof nor the walls drip with water. Children are safer and their studies are also going well.